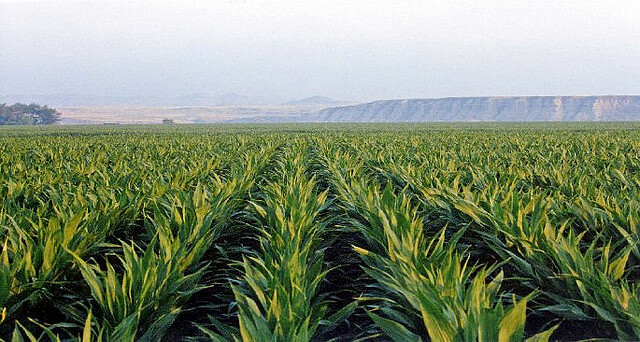 The principal crops grown on the Harding farm are corn, alfalfa and grass. The corn is either chopped for silage or combined as shell corn. Either way, the corn harvested on the farm is used to feed the cattle in the feedlot. Three cuttings of hay are put up on the alfalfa fields. The first and second cuttings are usually kept at the farm and ground up for use in the feeder calves’ rations. The third cutting is hauled to the ranch to feed to the cows that are being wintered there. There are several grass and alfalfa/grass mixture fields that are used for special purposes. Several pure grass fields are planted with a grass variety known as New-Hy. This grass variety does exceptionally well in high water table and high saline areas. This grass is typically fed to the calves while they are being weaned. One of the alfalfa/grass mixture fields is baled into small square bales. These bales are hauled to the ranch on Locate Creek and used in the calving barn during calving season. The types of soil at the farm vary greatly depending on each particular field. The fields that are closer to the river are sandier in texture, while the soils, as one moves east from the river, particularly in the fields surrounding the feedlot, are more clay-filled in nature. 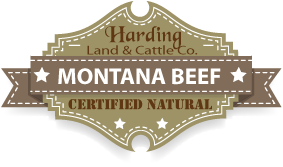 The farm/feedlot combination works well for the Harding Land & Cattle Company operation. The feedlot activities consume all of the winter months, but since the feeder calves are only backgrounded at the Harding farm, they are typically shipped out by the time spring farming begins. The bulls and replacement stock are kept in the feedlot throughout the spring and even the summer months in some cases.